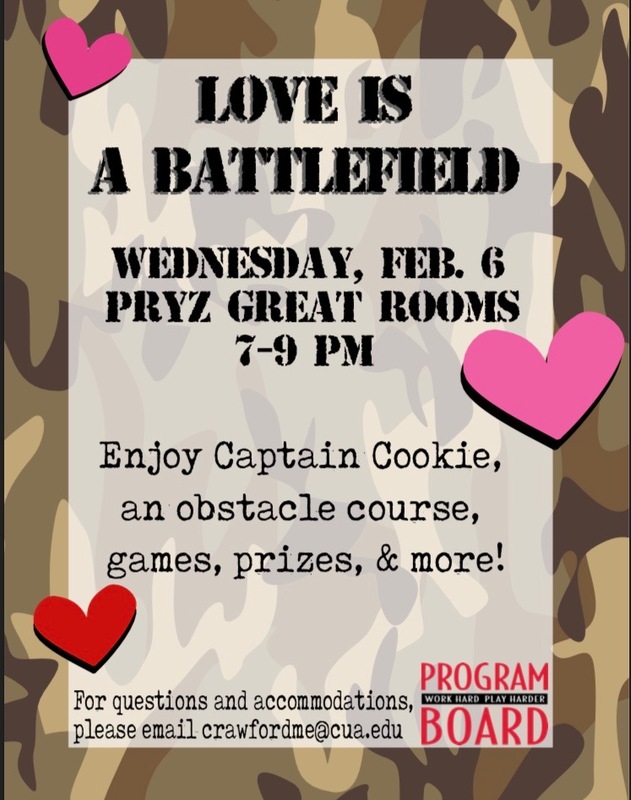 Program Board hosted the “Love is a Battlefield” event on Wednesday, February 6 from 7pm-9pm in the Pryzbyla Great Rooms. The event represented a lighthearted anti-Valentine’s Day theme with activities and sweets that created an exciting experience for all students whether they had a valentine or were single and ready to mingle! The event was hosted by the Programming Chair Meghan Crawford, a junior psychology major. It was co-hosted by her Programming Assistant Joseph Hehl a sophomore architecture major. The event was hosted by the Programming Chair Meghan Crawford, a junior psychology major. It was co-hosted by her Programming Assistant Joseph Hehl a sophomore architecture major. The event included a huge inflatable obstacle course decked out in camouflage. In the obstacle course two competitors raced to jump through holes, push through columns, climb up a steep wall, and slide down to win the game. There were also two other carnival games including a marshmallow launcher game and a dartboard game. For the marshmallow game, students had to get six mini marshmallows of the ten provided into the cups to win a box of assorted chocolates. Students could win a stuffed animal after playing the dartboard game if one of their darts hit one of the balloons on the wall which was secretly filled with confetti. Those who only came for the food were not disappointed. Captain Cookie catered this event providing 200 cookies with four different flavors including chocolate chip, double chocolate chip, funfetti, and snickerdoodle. There were also homemade rice krispie treats and a chocolate fountain with a wide variety of options to dip into the chocolate, such as bananas, strawberries, Oreos, and Nilla wafers. A lot of people loved the photo booth which had a hanging heart background and fun Valentine’s Day themed props including heart-shaped glasses and signs that said “bestie”, “be mine”, and “XO”. 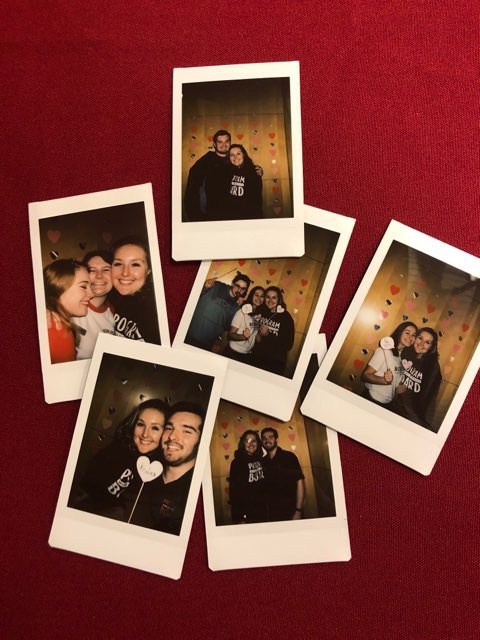 Best of all, the photos were taken with a colored polaroid camera, that made the ability to obtain their photos very convenient and fun. However, the best part of the night was the ability to send letters to not only students’ friends and valentines, but also the troops. At this event students could send a personalized letter to the troops, through the St. Thomas Church and Community Center, to make the people fighting for their country smile and remind them of what they are fighting for. The letters to the troops tied into the “Love is a Battlefield” theme and provided students with a fun pre- Valentine’s day activity.